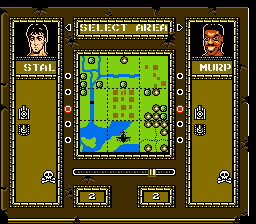 Battle Storm is a strategy game for the Nintendo Entertainment System. 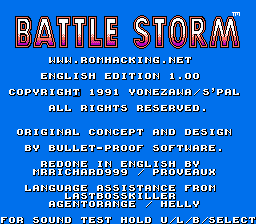 Here is a full translation for the NES game, Battle Storm. 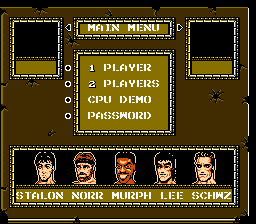 In this strategic warfare game, you can take control of Sylvester Stallone, Chuck Norris, Eddie Murphy, Bruce Lee, and Arnold Schwarzenegger. Fight it out on the battlefield with tanks, helicopters, jets, and missiles in order to destroy the opponents base! 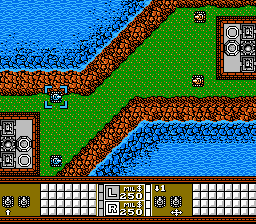 V1.0 Update - Proveaux has fixed the dialogue for entering the 2 secret levels. 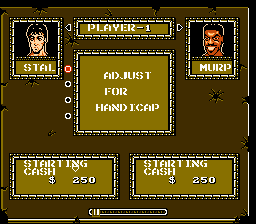 The game is now fully completed!